The diagram below is a schematic representation of the i3B model of collaboration between knowledge institutes, high tech companies and end users. The collaboration is aimed at joined research, development and commercialization of innovative ict solutions for brain body and behavior. 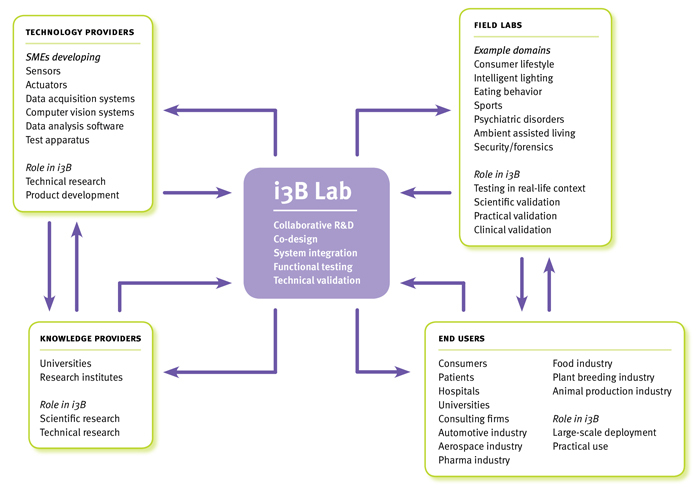 The i3B network can utilize (field) lab facilities to exchange ideas, develop prototypes, test and finally introduce to the world innovative ICT solutions for Brain, Body and Behavior. *In the i3B Lab the prototypes of the technology providers are tested in relevant but small-scale lab environments with representative test subjects. The prototypes are technically validated, debugged, iteratively improved and combined with tools from other partners into integrated systems. As soon as they are robust enough they are offered to the next link in the chain, field labs. *Field labs are controlled environments, modeled after the real world, where tests and valorization is done with end-users. Research at universities and institutes results in scientific knowledge about brain, cognition, physiology, and behavior, the measurements needed for this and the desired read-out parameters. These are the participating high-tech SMEs that develop ICT tools (hardware or software, components or systems) with which specific 3B aspects can be measured and analyzed. The design of these tools is based on the knowledge produced by the knowledge providers. These are domain-specific research facilities such as the Restaurant of the Future (nutrition), Philips ExperienceLab (consumer lifestyle), CSI Lab (forensic research), InnoSportLabs (sport), etc. Here the i3B tools are validated in field tests and clinical studies before they are launched commercially. Eventually money is earned as soon as i3B tools are sold to consumers, hospitals, universities, and companies.